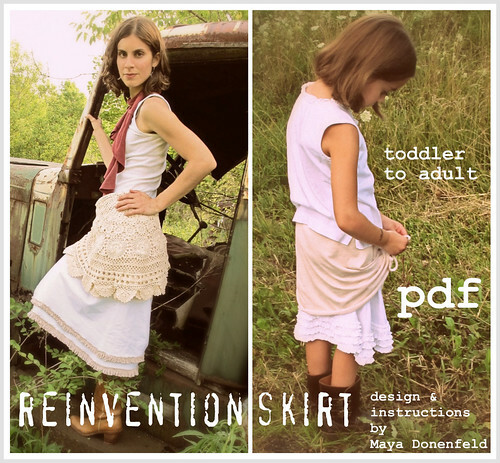 maya*made: The Reinvention Skirt! PDF now available! 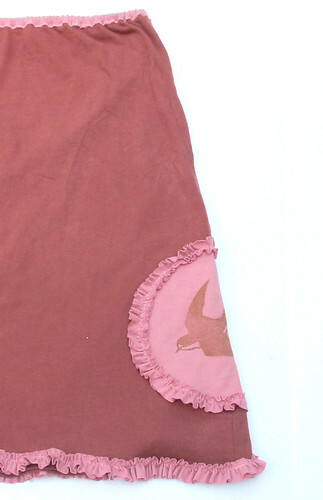 The Reinvention Skirt! PDF now available! Finally! It's now available in the shop right here. ...and here are two of my favorites you haven't seen, yet... they can easily be sized down for little girls, too. And now I'm ready for my next project... lots on the list! Happy day to you! Whoopee!!! I've just been tidying/excavating in my craft room and by course came across some fabric I'd love to have as a skirt, even some for little Hana...what excellent timing! Gorgeous! 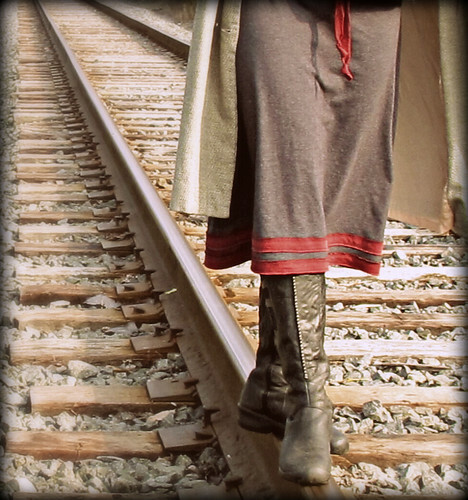 I can't wait to make one of these for Fall, thinking some knee highs might be in the works for it! Yeah! I ordered mine already...can't wait to get the pattern and try it out. I love the last one. Dark gray and burnt orange with high boots. Lovely. Thank you for all the hard work you have put into this pattern for us! Love that last one! I have a purple skirt with a brown ribbon on the bottom that I made when I was pregnant (jersey is the best for bellies) but those colors together are so much better! It's great! I can't wait for the pattern to arrive! I have a stupid question. In my head, I think I know this answer, but I thought I might should ask before I get all spendy. I'm plus sized. Will this pattern tell me how to plus size the skirt? Is it a general principal that applies to any tshirt/design? I just want to know that if I spend my $12, I can make a size 22/24 skirt to wear. I'm in mad passionate love with these skirts, so I just wanted to be sure before I jumped in head first. Thanks for the skirt love!! It was wild to come home to all of your enthusiasm here and in my shop. I'm so incredibly appreciative! Lacey, such a wonderful and valuable question. I don't have an answer, but a possible solution. The instruction does have a formula for expanding from a 2 panel skirt to a 4 for increasing width. I did not have a tester for plus sizes, so I can't be positive. You can e-mail me if you'd like to be the plus size tester! For all you tall women, I have included tips for increasing length, too! It's been so neat to see your progress on this project, and now, here it is! In love! WOW! Maya this is beautiful. I love the one with the doily - what a cool concept to add a vintage doily to a simple skirt. I want to make that actually. Wow, this is a sweet pattern! Excited! With a couple of very spring-like days lately this pattern will give us a little taste of summer on the way! Perfect timing to start planning our NZ summer wardrobes! thank you so much for this, Maya! just reviewed the pattern this morning and it is beautifully done- so thorough, inspiring and lovely. Can't wait to sit down and sew! You MUST love a pattern that goes from toddler to Adult! Just wonderful! I like it! Can I use my regular sewing machine for jersey, or do I need a serger? I LOVE these skirts! WOW Maya! I am SO in love! oooh, I didn't realise it was for grown-ups too! I love that grey and red one especially! Love the hem stripes on that last one. Coveting those boots too! So great to see more projects made out of previously loved clothing. wow Maya!! Love this skirt! I love this skirt!!! Beautifully done. I've posted photos of my version as well as a link back to your original on my blog if you'd like to check it out. 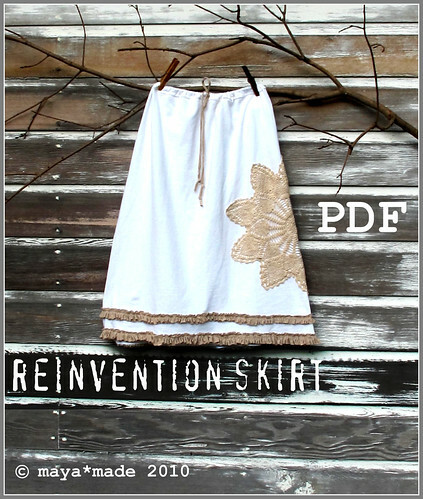 The Reinvention Skirt is listed as "Sold" in your store. Will you be offering it again? My wife is very, very interested in it.